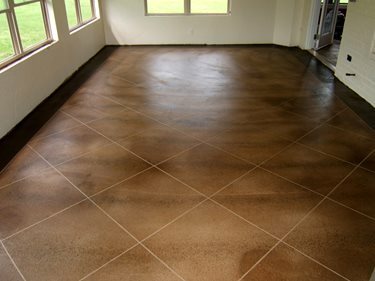 There are a wide variety of overlay systems available for refinishing concrete flatwork, ranging from ultra-thin systems (also called "microtoppings" or "skim coats") that can be applied in layers as thin as a credit card to floor underlayments that go on at thicknesses of up to an inch or more in one lift. Each overlay type offers different decorative options and performance attributes (see table below). Although the type of overlay you choose will depend primarily on the final look you want to achieve, it's equally important to consider the conditions the overlay will be exposed to (see Five Factors to Consider When Choosing a Resurfacing System). Generally, higher-build systems will stand up better to wear and tear and hide flaws more effectively than ultra-thin toppings. They will also permit the use of deeper patterns and textures. Microtoppings or skim coats Featheredge to 1/8 inch Can be troweled to a texture or troweled silky smooth. You can incorporate color into the mix, broadcast dry pigments onto the surface while troweling for a marbleized appearance, or accent with stains and dyes. These polymer-based systems are applied super-thin, giving them the ability to flex, unlike other systems. May also be applied to wall surfaces. Spray-down systems 1/8 inch Usually applied as a splatter coat or a knock-down (troweled) finish, and are ideal for use with paper or plastic stencils. Available precolored or can be integrally colored during mixing. Stains, dyes or tints may be applied for accent color. The textured finish is durable and skid-resistant, making it well suited for surfaces such as pool decks, sidewalks, and driveways. Stampable overlays 1/4 to 3/4 inch Can be stamped and textured (similar to conventional stamped concrete) to mimic brick, slate, natural stone and other materials. Color options include broadcast pigments, colored liquid or powdered releases, stains, dyes and tinted sealers. Are applied thickly enough to accept texture and cover minor imperfections in the concrete substrate. Self-leveling overlays 1/4 to 1 inch (in one lift) Can be left seamless (except at joints) or used as a canvas for sawcut or engraved designs. For color, mix in integral pigments or apply stains, dyes or tints. 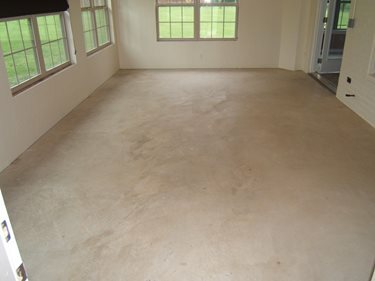 Restores structurally sound yet worn concrete surfaces and can be used to level uneven floors. Underlayments Up to 1 1/2 inch Removal of weeds and moss that grow in the joints; refilling joints with sand as needed. Restores structurally sound yet worn concrete in preparation for floor coverings. Provides a smooth, level base.